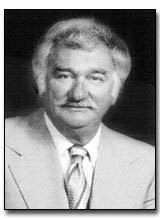 Eugene Klein was president of the NFL’s San Diego Chargers from 1966 to 1984. The one-time president of the National General Corporation (1961-1973) and former U.S. Air Force captain also owned the Del Rayo Racing Stables from 1982-1989. Klein’s racing laurels include victories in the 1985 Preakness Stakes (Tank’s Prospect) and 1988 Kentucky Derby (Winning Colors). He earned Eclipse Awards as “Owner of the Year” in 1985, 1986 and 1987; and the Eclipse Award for “Horse of the Year” (Lady’s Secret) in 1986. He also produced seven Breeder’s Cup winners. The New York-born Klein was actively involved in San Diego civic development as well as Southern California charitable and non-profit philanthropy. Among his interests were the San Diego Hall of Champions Museum and the development of the San Diego area as a major sports center.